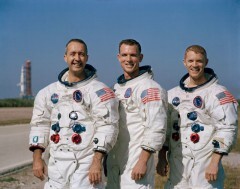 The Apollo 9 crew of (left to right) Jim McDivitt, Dave Scott, and Rusty Schweickart began training to support the D mission in 1966. Their spectacular test flight cleared another hurdle on the road to planting American bootprints on the Moon (Credits: NASA). By the beginning of 1969 the Apollo command and service modules (CSM) which would transport men to the Moon had been extensively tested, but an “all-up” demonstration of the entire ship, including the lunar module (LM), remained untried. The first flight-ready LM had arrived at Cape Kennedy in June 1967, and, though not wholly complete, it was successfully launched on an unmanned test in January of the following year. Its TRW-built descent engine was fired, as was its ascent engine, and the spider-shaped vehicle proved its guidance system. However, all was far from well with the LM. The ascent engine—needed for astronauts to rise from the lunar surface—had fuel-injector problems and the craft’s windows became fractured or blown out during high-temperature tests. Broken wiring, stress corrosion, and excessive weight added to the LM’s headaches. Still, confidence in the first unmanned mission (LM-1) convinced NASA managers that a repeat (LM-2) was not necessary and efforts accelerated to send LM-3 into orbit with a human crew. It was called “the D-Mission,” and to understand where it “fitted” in the Apollo lunar landing framework, it is important to recap a number of fundamental changes to NASA’s plan. In September 1967, the agency defined seven steps—”A” through “G”—to land on the Moon. First came unmanned tests of the mammoth Saturn V booster with the Apollo CSM, flown as Apollo 4 in November 1967. The “B” mission, completed by Apollo 5 in January 1968, was the unmanned LM test. A piloted “C” flight involved the CSM in Earth orbit and took place in October 1968. The final steps to the Moon focused on four increasingly difficult missions: “D” (a manned demo of the whole Apollo spacecraft in Earth orbit), “E” (a repeat of D, albeit in a high elliptical orbit), “F” (a full dress rehearsal in lunar orbit), and “G” (the landing itself). During the course of 1966, astronauts Jim McDivitt, Dave Scott, and Rusty Schweickart were named to support the D mission. Their CSM would be launched atop a Saturn IB rocket, followed a few days later by the launch of another Saturn IB, carrying LM-3. McDivitt’s crew would rendezvous, dock, and perform joint exercises with the lunar module, including a spacewalk by Schweickart to put the lunar EVA suit through its paces. Chomping hard at the heels of McDivitt’s team was the E crew of Frank Borman, Mike Collins, and Bill Anders…but circumstances in early 1967 would complicate the relationship between these six men. On 27 January, astronauts Virgil “Gus” Grissom, Ed White, and Roger Chaffee were killed when a flash fire swept through their command module during a launch pad test. More than a year later, the McDivitt and Borman crews seemed in line to fly the D and E missions sometime in late 1968 or early 1969. 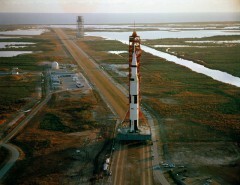 However, when the Saturn V flew its enormously successful first flight, and worried by CIA reports that the Soviet Union was close to testing its own lunar rocket, NASA accelerated Borman’s mission to a full-blown circumlunar expedition, thus eliminating one of the steps in the A-G plan and bringing the landing closer. Hopes that their E mission could be retasked as something called “E-prime,” flying to the Moon with LM-3, fell to pieces when it became obvious that the lunar module would not be ready in time. In August 1968, it was decided that Borman’s crew would fly first on Apollo 8 to circumnavigate the Moon, without an LM, after which McDivitt’s men would fly Apollo 9 on the D mission to wring out the whole spacecraft in Earth orbit. Mounted atop the most powerful rocket ever brought to operational status—the Saturn V—the Apollo 9 spacecraft rolls out to Pad 39A (Credits: NASA). During training, Scott had devised a routine in the simulator to handle this daunting role. First, he would check Apollo’s electrical, communications, and environmental systems from Schweickart’s seat, then would move to the center couch to fulfil his own duties of setting up the relevant programs on the computer, before finally moving into McDivitt’s couch to perform the re-entry manoeuvre itself. “It was pretty exacting,” he wrote. Yet it was a dire eventuality for which all Apollo command module pilots would have to be prepared. Apollo 9 was indeed postponed, but not through lack of training. Originally set to fly on the last day of February 1969, the crew arrived at Cape Kennedy three weeks prior to launch to finish their training and quarantine. Living conditions had changed quite markedly from the spartan crew quarters of Mercury and Gemini days: they each had individual bedrooms, a shared bathroom, a large and comfortable living area, a miniature gym in which they played handball at night, and a superb chef, Lew Hartzell. “He was great,” Scott related, “a former cook on a tugboat, who served us with marvelous meals every time we sat down.” But in the final days before launch, Jim McDivitt’s white blood-cell count was found to be low, hinting that he might be coming down with a cold. The brief postponement did not detract from what promised to be a spectacular, though challenging, year for NASA: the year in which John Kennedy’s very public promise to land a man on the Moon would be realized. Up to five missions were planned, each one building on—and dependent on—the success of its predecessor. If the D mission was a success, the stage would be set for Tom Stafford, John Young, and Gene Cernan to ride Apollo 10 to the Moon in May for the F mission. Only if Stafford’s flight verified the performance of the LM’s engines and consolidated knowledge of the lunar gravitational field, could Apollo 11—the long-awaited G mission, with Neil Armstrong in command—stand any chance of touching down on the lunar soil sometime in July. Despite the confidence, the doubts remained. If Apollo 11 did not succeed, the task of making the first landing would pass to Apollo 12 in September, and if that failed there would be time for Apollo 13 in November to achieve Kennedy’s deadline. Even with the benefit of hindsight, it remains remarkable that such enormous steps were taken in such a short span of time. Four percent of the federal budget (during the mid-1960s) had much to do with the hectic pace of Apollo’s journey to the Moon, but the ability of the United States to achieve a lunar landing on this timescale—barely eight years—certainly puts current projects to return humans to the lunar surface to shame. In an ironic twist, closer and more cordial working ties with the Soviet Union, cemented by the Strategic Arms Limitation Talks from 1969 onward, eliminated the need for such a vigorous, all-or-nothing human space program. Apollo’s race to the Moon was seen, quite literally, as “peaceful warfare” with the Soviets and the astronauts were its warriors. “We were at war,” wrote Gene Cernan in his autobiography, The Last Man on the Moon. “If they reached the Moon first, it would be Sputnik and Gagarin all over again, but much worse, and we would be the losers.” Unlike Sputnik and Gagarin, failure to achieve the lunar landing would not simply be embarrassing, it would represent an abject failure to deliver on Kennedy’s promise. As February wore into March 1969, the Apollo 9 crew—colds or no colds—could not launch soon enough. Had the Saturn V risen or had Florida sunk? This question was on many minds whenever a Saturn V took flight, as Apollo 9 amply demonstrates in this stunning liftoff view (Credits: NASA). By 7:30 a.m. EST, 1 March, when the clock resumed, the main concerns surrounded a low-pressure disturbance in the Gulf of Mexico, just southwest of Cape Kennedy, which was causing overcast weather conditions. As the countdown entered its final stretch, dull, storm-bringing stratocumulus clouds covered 70 percent of the sky, with darker blotches of altostratus high above them. Nonetheless, preparations continued. 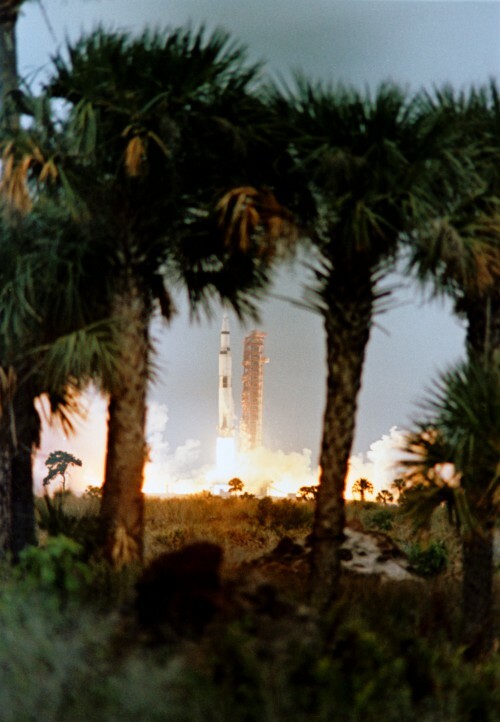 On the evening of 2 March, Scott and Schweickart drove out to the pad to watch as their Saturn V, lit up by searchlights, underwent its final checks. Next morning, clad in their pure white space suits, the three astronauts arrived at the pad to a very different scene. The scores of engineers and technicians were gone and it was an eerily silent place, the sense of stillness punctuated only by the hissing of the Saturn itself. 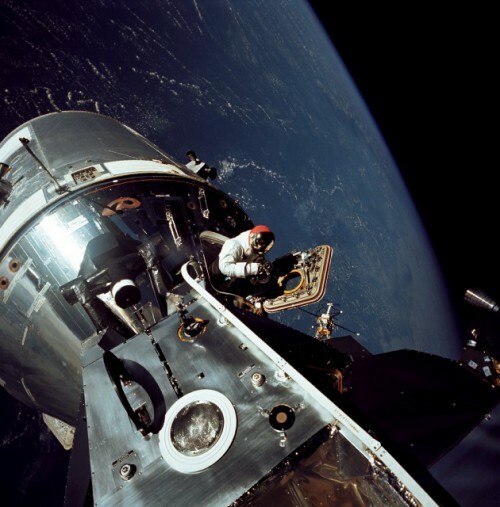 As technicians helped Jim McDivitt into the left-hand seat of the command module and Rusty Schweickart into the seat on the right, Scott waited patiently outside on the gantry and had a few precious minutes to gaze out across the marshy expanse of the Cape and watch the Sun peek over the horizon. Precisely on the stroke of 11:00 a.m., the five mighty F-1 engines in the Saturn V’s first stage roared to life. From a height, weight, and payload-to-orbit standpoint, it remains the largest and most powerful rocket ever brought to operational status. McDivitt, Scott, and Schweickart’s ride to orbit was virtually trouble-free, although the experience was truly unforgettable. For Scott, who flew two Saturn Vs in his astronaut career, it was like being compressed and released atop a giant spring, as the forces and vibrations alternately threw them against their restraining straps, then smashed them back into their seats. Jim McDivitt (right) and Rusty Schweickart demonstrate the smallness of the lunar module’s cabin in this telecast from Spider (Credits: NASA). In its Apollo 9 press kit, NASA identified no fewer than seven ”alternate” flight plans which McDivitt, Scott, and Schweickart might pursue in the event of problems. Firstly, Alternate “A” presupposed a problem with the extraction of LM-3 from the S-IVB…and this would have enforced a full-duration, 10-day solo mission with just the CSM. The other alternates applied to problems with LM-3 itself—covering everything from life-support system failures to a troublesome engine, and from a faulty rendezvous radar to an unsafe descent stage—and in each case the crew would have performed as much as they could with the available set of options. Whatever happened, if possible they would attempt station-keeping with the lander, Schweickart’s EVA, and a long burn of the descent and ascent engines. In completing the first transposition and docking, the Apollo 9 crew had achieved the first American link-up between two pressurized, habitable spacecraft. The next order of business was to confirm that the docking probe and tunnel between the command and service modules and the lunar module was functional. Unlike the spacewalk by Soviet cosmonauts Yevgeni Khrunov and Alexei Yeliseyev in January 1969, McDivitt and Schweickart would transfer between ships internally, in shirtsleeves. After pressurizing the 4-foot (1.2 m) long tunnel between the two craft, verifying the integrity of the 12 latches on the docking ring, connecting umbilicals to provide the lunar module with electrical power, and disassembling the probe and drogue, it was time to separate from the S-IVB for good. Four hours into the mission, Scott threw a switch which fired pyrotechnics to release the lunar module from the S-IVB, and again pulsed the thruster quads to draw the complete Apollo craft free. Forty minutes after separation, the S-IVB’s restartable J-2 engine was lit again to enter an “intermediate coasting” orbit, preparatory for a third and final burn. The final firing, which began some six hours into the mission and burned until the propellant supply was all used up, allowed the S-IVB to escape Earth’s gravitational influence and established it in a solar orbit. Major objectives of the repeat firings were to demonstrate the J-2’s ability to restart and to test its performance under conditions beyond those for which it was designed. Cocooned within the protective confines of the S-IVB final stage of the Saturn V, the Lunar Module is seen during the transposition and docking maneuver (Credits: NASA). With this work complete, the time finally came for what Slayton called the mission’s “big deal”—the checkout of LM-3 by McDivitt and Schweickart. 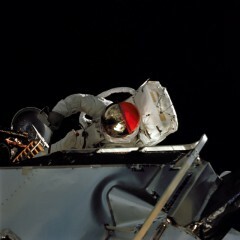 After Schweickart made a dramatic spacewalk, the lunar module was to undock for a series of joint rendezvous exercises. During his planned two-hour excursion, Schweickart was to put the EVA suit with its bulky backpack, designed to enable astronauts to work on the lunar surface, through its paces. He was to exit through the small, square hatch and onto the lunar module’s front “porch.” Scott had spent more than two years perfecting his knowledge of the CSM, so McDivitt and Schweickart had devoted themselves to understanding every inch of “their” ship. Each man had prepared exhaustively for his respective tasks. What they had not prepared for, or bargained on, was Schweickart’s adverse reaction to the space environment, which almost stalled the mission in its tracks. Early on 5 March 1969, 45 years ago this week, two men floated through a 4-foot-long (1.2-meter) tunnel from their command ship into a spider-shaped vehicle whose descendants would soon carry astronauts to the surface of the Moon. Apollo 9 was not destined to go to the Moon, or even depart Earth orbit, and yet, as noted, its criticality to the goal of planting American bootprints in the lunar dust before the end of the 1960s cannot be underestimated. During their 10 days circling Earth, the crew of Jim McDivitt, Dave Scott, and Rusty Schweickart would prove for the first time that Apollo—as a complete spacecraft, with its conical command module, its cylindrical service module, and its arachnid-like lunar module—was capable of performing as advertised. However, no sooner had they begun work, the first problem reared its head…for one of the astronauts was sick. When McDivitt and Schweickart floated through the connecting tunnel into the lunar module early on the morning of 5 March, their actions to prepare it for its first manned flight were honed to perfection by hundreds of hours of training. At 6:15 a.m. EST, Schweickart entered its cramped cabin—about the size of a broom cupboard, dominated by the large, cylindrical ascent engine cover in the middle of its “floor”—and was followed by McDivitt less than an hour later. Both men agreed that the whirring systems, particularly the environmental control unit, were noisy. By 8 a.m., the first major step in preparing their lunar module for independent flight was completed when its four spidery legs were swung away from the body. Time, however, was not on their side, and shortly thereafter McDivitt was forced to admit to Mission Control that they were behind schedule. The reason: Schweickart, two days into his first space flight, was sick. 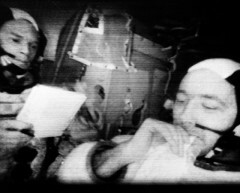 At the time of Apollo 9, “Space Adaptation Syndrome” was virtually unknown, and the bulk of military fighter and test pilots in the astronaut corps, imbued as they were with seemingly limitless stores of testosterone and The Right Stuff, tended not to report it, lest their susceptibility impair their chances of being assigned another mission. “It had been accepted,” wrote Gene Cernan in his autobiography, The Last Man on the Moon, “that everyone felt woozy on getting up there, and…maybe you might even toss your cookies a couple of times, but you sure as hell didn’t tell anyone…and neither did your crewmates.” Frank Borman only reluctantly admitted to throwing up on the way to the Moon during Apollo 8, swearing Jim Lovell and Bill Anders to secrecy. McDivitt’s crew was determined to avoid such problems and, upon reaching orbit, tried not to make sudden head movements and took the anti-nausea drug Dramamine. Still, issues of dizziness plagued them for the first couple of days of the mission. Things really got bad on the 5th, when Schweickart was preparing the LM for its first solo flight. He suffered a bout of nausea as soon as he awoke, and then felt increasingly queasy as he donned his space suit in the weightless cabin, finding a vomit bag just in time. As Lunar Module Pilot Schweickart performed his initial duties, flipping switches to begin powering up the lander’s systems, his condition steadily worsened. 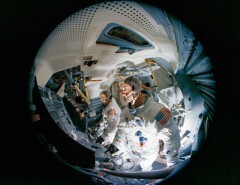 As fellow astronaut Buzz Aldrin explained in his book, Men from Earth: “Rusty … experienced brief vertigo as he floated up through the tunnel into the LM, and ended up staring down at the lander’s flight deck.” When McDivitt, who had also suffered from episodes of dizziness, joined his crewmate, Schweickart vomited again. Apollo 9 marked the first time that two American manned craft would rendezvous, dock, and transfer crews, which demanded individual names for them. There were, admittedly, formal international designations—the main spacecraft was “1969-018A” after reaching orbit, the Saturn V rocket’s S-IVB final stage became “1969-018B,” crew-carrying ascent stage of the lunar module became “1969-018C,” and its discarded descent stage became “1969-018D”—but those, surely, would not do. Names it seemed, for the two manned craft, were definitely needed. Whither the “Gumdrop”? 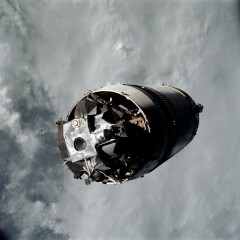 It has been suggested that the command and service module’s shape, or its blue cellophane wrapping, or both, were behind the Apollo 9 crew’s choice of name for their craft (Credits: NASA). Frivolous or “sensitive” names were frowned upon by NASA, but for Apollo 9, names were necessary. The ungainly appearance of the LM and the conical profile of the CSM made the choice of names an easy one for McDivitt, Scott, and Schweickart: The former would be called “Spider,” and the latter “Gumdrop.” Two possible reasons have come to light for the Gumdrop name: Firstly, and quite obviously, the command module closely resembled the cone-shaped, sugar-encrusted candy, and secondly, it may have been on account of the blue-coloured cellophane wrapping in which that module was delivered to Cape Kennedy. Although introduced as nicknames, extensive use by the astronauts and their training teams led to their becoming official radio callsigns. Aboard Spider, concern mounted about how to tackle Schweickart’s forthcoming EVA. In a bid to preserve his comrade’s privacy, McDivitt requested a closed-loop medical consultation with Mission Control, and it was decided that a planned spacewalk from Spider over to Gumdrop was too risky. The chances of Schweickart suffocating if he threw up again, inside his suit, did not bear thinking about. The plan called for him to spend two hours outside, exiting the lunar module and working his way by handrails over to the open hatch of Gumdrop, where a fully-suited Dave Scott would conduct a “stand-up” EVA to observe. Schweickart would then return to the lunar module. The purpose of this test, in addition to evaluating the suit, was to show that a returning lunar crew could spacewalk to the CSM in the event of their being unable to pass through the docking tunnel. Instead, a comparatively straightforward opening of the hatch for 45 minutes, during orbital daylight, was advocated. By thus exposing themselves to vacuum, but remaining inside Spider, McDivitt and Schweickart could conduct at least some tests of the suits in the required conditions. As managers reprioritized the EVA, the lingering question of how much information to release to the media had worked its way to NASA Administrator Tom Paine. Many astronauts were furious and one even declared that he would “never tell the ground a goddamn thing from up there.” Eventually, Paine concurred that the confidentiality of the Schweickart tape should be respected. If the spacewalk happened—and early on 5 March it seemed unlikely—the astronauts’ third day in space was far too busy for them to worry about it. Their packed schedule of engineering and other objectives got underway at 9:28 a.m., with a five-minute televised transmission from inside Spider, showing its instruments and displays, various internal features, and the faces of McDivitt and Schweickart. Managers were suitably impressed by the quality of the images, but not by the sound, which they considered less than satisfactory. Three hours later, McDivitt executed the first firing of the descent engine. In addition to evaluating the combined spacecraft’s handling characteristics, the six-minute burn demonstrated the effectiveness of the lunar module’s digital autopilot and how the descent engine behaved at full throttle. McDivitt was impressed by the descent engine’s performance. Only seconds after starting the burn, he had yelled, “Look at that [attitude] ball; my God, we hardly have any errors.” Twenty-six seconds into the firing, those errors remained virtually non-existent and the commander even took a few seconds for a bite to eat. Schweickart awoke on 6 March, apparently much recovered, no longer nauseous or pale, and McDivitt, notwithstanding the reservations of ground controllers, decided to press ahead with his scheduled EVA onto the lunar module’s porch. The cabin was depressurized, although McDivitt found that he had to exert more force than expected to turn the handle and swing the waist-high hatch inward. Clad in a bulky suit virtually identical to that which crews would use on the Moon and anchored by means of a tether, Schweickart began moving onto the porch a little over 14 minutes later. Balanced on the Lunar Module porch—with one of the footpads visible “below” him—Rusty Schweickart puts the lunar suit through its paces (Credits: NASA). In essence, he was now a miniature spacecraft in his own right. “What was important about this EVA,” wrote Deke Slayton, “was that the lunar pressure suit was completely self-contained. All the suits used on the Gemini EVAs had relied on the spacecraft to provide oxygen and communications. The consumables and communication equipment for the lunar suit … were all in [the] backpack.” With the satisfying gurgle of water coolant and a stable pressure indicator, Schweickart lost no time. As soon as he was outside, he secured his feet in a pair of so-called “golden slippers”—boot restraints attached to Spider’s porch, painted gold for thermal reasons—and gained his bearings before embarking on his first task: to observe, photograph, and retrieve thermal samples from the exterior of the LM. By now, Dave Scott, clad in a slightly different suit that was dependent on Gumdrop’s systems for life support, had opened his hatch for a “stand-up” EVA. Next, Schweickart—joking at his own sandy hair color by aptly nicknaming himself “The Red Rover”—began his first abbreviated attempt to evaluate his ability to move and control his body in the lunar suit. His planned transfer to Gumdrop and back had been cancelled, but he was able to obtain photography of Scott’s activities and imagery of the exteriors of both spacecraft. At length, he returned inside Spider and Scott retreated to Gumdrop. One sound that the astronauts apparently did not hear was the repeated calling from Mission Control; indeed, they were so preoccupied and talkative that the duty capcom was forced to radio 10 times—“Red Rover, do you read? Gumdrop, do you read? Hey, does anyone up there read me?”—before he received a response. The four-way radio chatter between Schweickart, Spider, Gumdrop, and Houston was all loud and clear. The main discovery was that leaving the lander in a pressurized suit was more straightforward than expected, and the depressurization and repressurization of the lunar module’s cabin ran without incident. As Rusty Schweickart performed his EVA from Spider, Dave Scott made a “stand-up” EVA in Gumdrop’s hatch. It was always recognized that in an emergency returning lunar crews might need to transfer by “extravehicular” means from the LM back to the CSM (Credits: NASA). 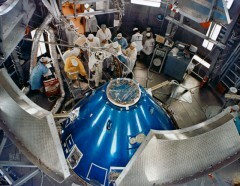 Still to be tested were Spider’s systems when flying independently of the CSM, including the rendezvous radar, descent and ascent engines, guidance computers, and the docking mechanism. Early on 7 March, keen to get an early start and get ahead on their timeline, McDivitt and Schweickart shimmied down the tunnel into the lander and sealed the hatches between themselves and Gumdrop. At the appointed time, Scott flipped a switch to release Spider…and nothing happened. The latches, it seemed, had “hung-up.” After several more tries, in which he repeatedly flipped the switch back and forth, Scott was successful and the two craft separated cleanly. After performing a brief fly-around to ensure that all was well, Scott pulsed his thrusters to back away. From his station on the left-hand side of the lunar module, McDivitt performed a pitch manoeuvre, then yawed, to enable Scott to verify that Spider’s four legs were properly extended. Forty-five minutes later, McDivitt fired the descent engine to insert Spider into a circular orbit some 12 miles (19 km) ”higher” than Gumdrop. As he throttled the engine for the first time, it ran smoothly until it achieved 10 percent thrust, but when advanced to 20 percent both astronauts noted a peculiar chugging noise. McDivitt paused and resumed and was delighted that the strange groaning did not recur, even when he throttled up to 40 percent. Next, the pyrotechnics were fired to jettison the descent stage and the ascent engine blazed silently to life to place Spider into an orbit “beneath” and “behind” Gumdrop. The kick affected more than just the crew: As the two sections of the vehicle separated, a small cloud of debris hit the ascent stage and knocked out its strobe tracking beacon. In accordance with the laws of celestial mechanics, the lander, being in a lower orbit, began to gain on its quarry. Despite the apparent grace of this orbital ballet, the dangers were still present. Spider had no heat shield, so could not return the crew safely to Earth, which meant that if McDivitt and Schweickart encountered insurmountable difficulties, Scott would have to rescue them. A few hours later, the first all-up demonstration of the lunar module in flight was completed in spectacular fashion, with Scott lining up and McDivitt executing an almost-perfect docking. Almost perfect, that is, because lighting conditions were less than ideal: the Sun was shining directly through the small rendezvous window directly above McDivitt’s head. “Using my alignment device,” Scott wrote, “I talked him through the manoeuvres and he was right on target, though there were more than a few tense moments.” Retracting the docking probe produced the welcoming “ripple-bang” of the capture latches engaging. McDivitt quipped that “that wasn’t a docking … that was an eye test!” During their six-and-a-half-hour independent flight, the two men aboard Spider had ventured around a hundred miles from Gumdrop and had cleared another obstacle on the road to the Moon. Two hours after docking, McDivitt and Schweickart rejoined Scott inside Gumdrop for what would be a fairly relaxed final few days in orbit. The now-unneeded ascent stage was jettisoned and one of the astronauts wistfully remarked that they hoped they had not left anything important behind. When the capcom asked if they had left the LMP—Schweickart—aboard by mistake, McDivitt replied that, no, “I didn’t forget him…I left him there on purpose!” A hairy start to Apollo 9 had given way to a huge success…and an opportunity for humor. Pictured during LM-3 training in February 1969, astronauts Jim McDivitt (foreground) and Rusty Schweickart would put the Lunar Module through its paces. They would test its digital autopilot, its descent and ascent engines, and its overall controllability (Credits: NASA). The two parts of Spider would ultimately meet the same fiery fate, burning up in the dense layers of Earth’s atmosphere, although at very different times. The descent stage lasted barely a couple of weeks, re-entering on 23 March 1969, with its remnants showering into the Indian Ocean, just off the coast of eastern Africa. For the ascent stage, on the other hand, more than a decade would pass before it finally took its destructive plunge. Shortly after being jettisoned by McDivitt’s crew, its engine was fired for just over six minutes to put it into an eccentric orbit with an apogee more than 1,000 miles (1609 km) high. Trajectory specialists predicted that it might burn up in the atmosphere sometime in the mid-1970s, but not until 23 October 1981—this author’s 5th birthday—did the last relic of what had been the Spider finally return to Earth in a firestorm of glowing debris. Splashing down on 13 March 1969, the achievement of Apollo 9 and its intrepid crew brought the lunar landing inexorably closer. Publicly, and within NASA, an enormous groundswell of support rose and it was even muttered that the next flight, Apollo 10, should be retasked with the landing, rather than its mandate of a full dress rehearsal in lunar orbit. This was both unwise and impractical, but highlighted the “Go Fever” prevalent at the time. Never were truer words written.